Chance of a morning shower. Cloudy. High 63F. Winds ESE at 5 to 10 mph..
Mostly cloudy skies early, then partly cloudy after midnight. Low 47F. Winds light and variable. 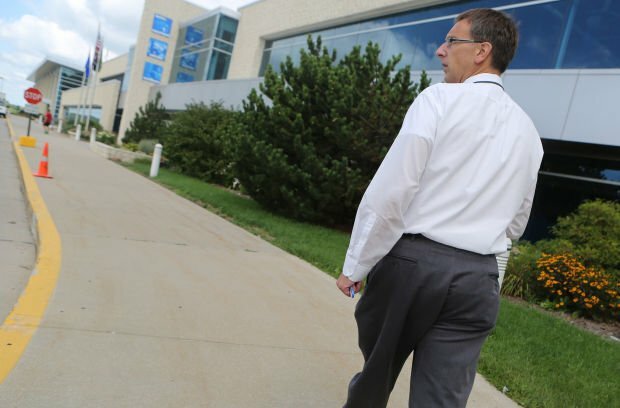 Tom Shircel, Pleasant Prairie assistant village administrator walks to the village's RecPlex. A 300-car park-and-ride lot is being built for people who work out at the RecPlex and then carpool with others to work. 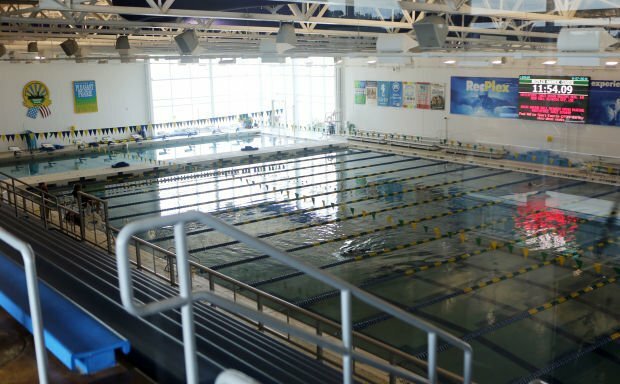 The Olympic-size pool at the Pleasant Prairie RecPlex was built with an $8 million donation from ULINE, a packing products distributor that moved to the village in 2010. A figure skater trains with her coach at the Pleasant Prairie RecPlex on one of its two NHL-size ice rinks. The RecPlex does not require any taxpayer money, being entirely supported by membership fees, rentals, and corporate donations. Basketball, volleyball and other sports are played at the 60,000-square-foot field house at the Pleasant Prairie RecPlex. Large corporate donations have helped fund the building of the facility. Bouncing basketballs, splashing water and the swoosh of blades on ice are the sounds of economic development in Kenosha County, Wis.
All that and more can be heard at the village of Pleasant Prairie's RecPlex, which houses a 60,000-square-foot field house, an Olympic-size swimming pool, two NHL-size ice rinks and other facilities for those who want to keep fit. Its building was sped forward in 1998 with a $4 million donation from WisPark, the developer of the 1,542 acre LakeView Corporate Park where more than 8,000 people work. The RecPlex was built at the edge of the Prairie Springs Park, established four years before before with a $1.6 million donation from WisPark. And when it came time to build a 50-meter Olympic-sized competition swimming pool in 2010 at the RecPlex, ULINE, a distributor or industrial packaging supplies, donated $8 million. The company had just moved its headquarters from Illinois to the Wisconsin village of 20,137 people. "People see this and they realize they can get a good quality of life here," village Assistant Administrator Tom Shircel said on a recent tour of the RecPlex. The jobs boom occurring in Kenosha County, which makes corporate donations like the above possible, was highlighted in an Aug. 6 address to the Northwest Indiana Forum by NAI Hiffman Senior Vice President Kelly Disser, a nationally recognized site selector. Disser pointed out regions like southeast Wisconsin are reaping the benefits of the national economic recovery while regions like Northwest Indiana may be falling behind. The corporate donations that have funded major parts of the RecPlex are one result of the village's economic development efforts, Shircel said. The RecPlex and the Prairie Springs Park in turn are the village's central amenity and a key to attracting new residents to the region. Pleasant Prairie officials are quick to point out the RecPlex operations are entirely supported by membership fees and rentals. That income also covers the payments on the $30 million bond used to finance its building, according to Pleasant Prairie Finance Director Kathy Goessl. In a far different setting, bouncing basketballs and the sounds of children growing stronger are also the sound of economic development at the 8,000 member Boys & Girls Club of Kenosha, just west of city's downtown. The new 79,000-square-foot club opened its doors in 2011 and was built with the help of a $5 million grant from the city of Kenosha's lakefront tax increment financing district. The TIF donation for The Boys & Girls Club is just one example of how development in the city benefits the city of 99,889 people, according to Kenosha Mayor Keith Bosman. TIF districts are often knocked as a tax-break for companies, but can be essential to big economic development deals and benefit the community at large if done properly, Bosman said. "When we do a TIF, it's based on solid financial thought," Bosman said. "It's not just, 'Here's your money, take it.'" Recently, it was that same lakefront TIF district, encompassing the 350-condominium Harbor Park Development, that needed help when housing values plunged because of the recession. Because Wisconsin law grants municipalities flexibility with TIF monies, it has been able to make payments on Harbor Park Development bonds with money from other TIF districts that are doing well. "If we couldn't move that money from performers to non-performers, its the taxpayers that would be paying the bill," Bosman said.